After six days of overindulging, the seventh night was going to be meatless . As usual, I being inspired by Mario Batali, read his stuffed cabbage recipe. The only important ingredient that I had on hand was a newly bought head of Cabbage. After thoroughly searching the fridge and the available vegetables, I assembled a filling that according to Cathie “was actually rather good”. At eating time it became patently clear that the Cabbage was too tough to chew even though it was boiled for better that 20 minutes. So cooks be aware and be sure that doesn’t happen to your stuffed cabbages. Actually it never happened to mine before last evening. 1. Preheat the oven to 375 degrees. Bring a large pot of water to a boil. Fill a large bowl with cool water & set it nearby. 2. Remove the tough outer leaves of the Cabbage, finely chop them & set them aside. Carefully cut out the cabbage core with a sharp knife. 3. Add 2 TB of Salt to the boiling water. Carefully add the whole Cabbage to the water & cook until tender or as long as it takes. Then transfer the Cabbage to the bowl of cool water & allow it cool. & set aside a dozen of the best & largest leaves. Chop most of the remaining Cabbage into 1/4″ pieces & set them aside. 5. In a large, deep sided saute pan, heat the EVOO over medium heat until just smoking. Add the Onions, Garlic, Turnips, & the raw & cooked diced Cabbage. Cook, stirring occasionally, until the vegetables are very soft, 12 to 15 minutes. Season with Salt & Pepper & allow to cool. 6. When the Vegetable mixture has cooled, add the Ricotta Salata & Parsley, gently fold together. Place a 1/2 cup of the Cabbage mixture to the lower part of the Cabbage leaf. Fold around the filling & if necessary secure with a toothpick. 7. Pour the Tomato Sauce into two small baking dishes, & arrange three of the Cabbage packets on top of each. Cover the dish tightly with foil, & bake for 30 minutes. 8. 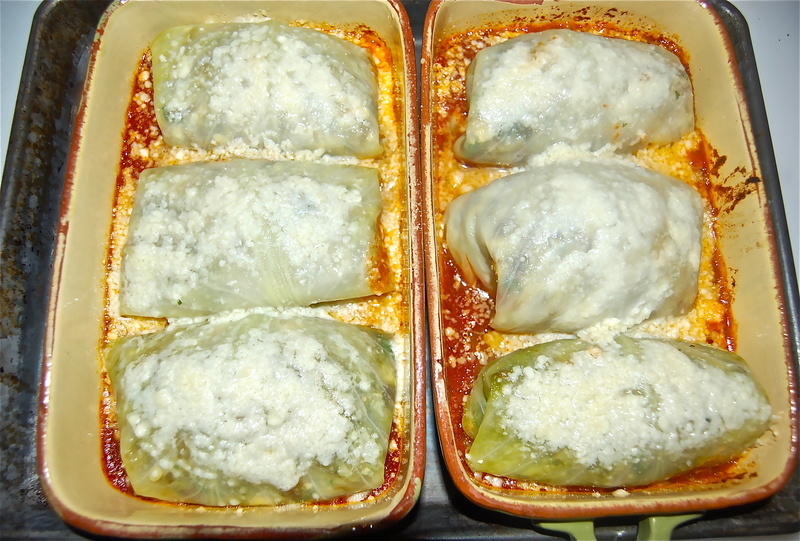 Remove the foil, generously sprinkle the Cabbage packets with the grated Pecorino, & bake for another 10 minutes.